League 1 club Doncaster are the lowest-ranked side left in the Challenge Cup as they join 11 Super League teams in the sixth round. Huddersfield Giants sign Bradford Bulls' teenage forward Oliver Wilson for an undisclosed fee. Former Leeds and Wakefield prop Richard Moore ends an 18-year career after a head injury forces him to retire. 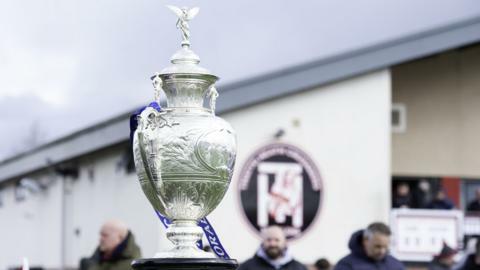 Keighley Cougars will host Yorkshire rivals and five-times winners Bradford Bulls in the Challenge Cup fourth round. Championship side Bradford Bulls progress to the fifth round of the Challenge Cup after a hard-fought 14-12 win over League One's Keighley Cougars at Cougar Park. Did this moment seal Bradford Bulls' fate? Read more on Did this moment seal Bradford Bulls' fate? Bradford's Adrian Purtell tells BBC Sport's George Riley about his return to rugby league after suffering a heart attack in 2012. Can business woman, singer and mum of the year Kate Hardcastle turn the Bradford Bulls' fortunes around?